Seems like the perfect fit for this out-of-the-way space. By Tae's ikura with shiso. The little counter behind Marmite proved too hidden-away for its short-lived creperie sibling, Petite Galette, but seems just about right for its new occupant. By Tae, a hand roll counter from chef Sun Hong, is open, quietly, after some sporadic popups earlier this month. Hong is no stranger to Chophouse Row, or slightly obscured destinations, for that matter. He was the opening chef at Matt Dillon’s Bar Ferdinand (back when it was Upper Bar Ferdinand) and the guy largely responsible for the Japanese-inflected dishes that wowed critics on those first visits. Now, though, Hong has set up shop just off the rear courtyard, prepping rice and wrapping sheets of nori around albacore with yuzu kosho or negihama with green onions or whatever else catches his fancy by season. 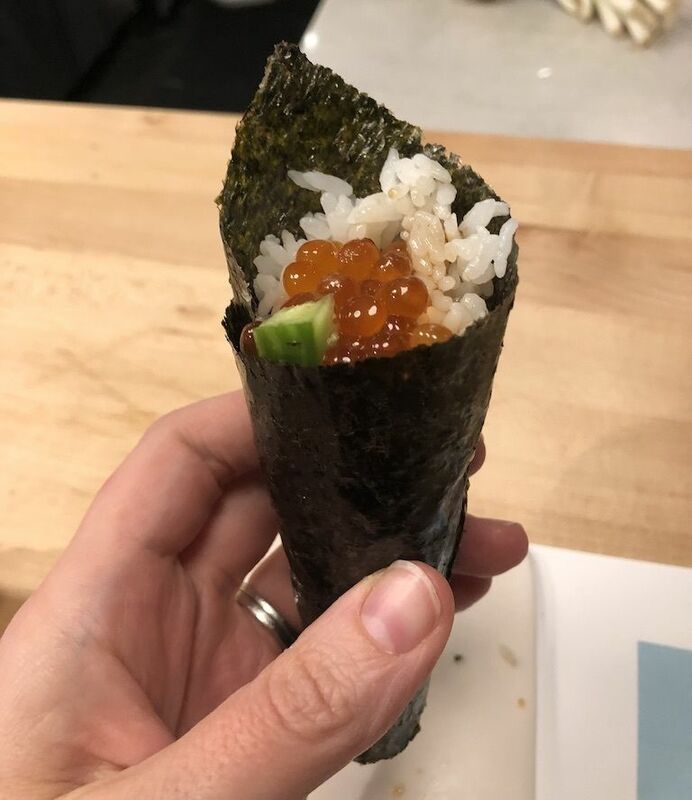 By Tae offers grab-and-go lunch boxes, but if you snag one of the four counter seats, you’re in for a set series of hand rolls presented directly from Hong’s jury-rigged work station to your fingertips (complete with a sake pour, if you so desire). In addition to formidable skills with rice and nori and pristine seafood, Hong possesses a genial persona, and a palpable enthusiasm for his seafood and finished product. It's the sort of thing that transforms an ultra-casual counter with very few menu items into a cool secret (and a highly personal setup that wouldn't work in a space much larger than this). By Tae is still finding its rhythm, but will be open for lunch this week from 11 to 3 and next week, except on Thanksgiving. A newly installed "drinking hour" runs from 4 to 6. Hong’s still musing over weekend hours, evenings, etc. so keep an eye on By Tae’s Instagram and official website for updates. Meanwhile, come early; those takeaway boxes do sell out, and I predict counter stools will fill up fast once word gets out.